Can we learn from the latest avalanche death ? On the 19th March 2013 a snowboarder was caught in an avalanche while riding at Le Tour. He was carried several hundred meters and then buried 1.8m under the surface. He was subsequently dug out by a rescue team and flown to Sion hospital in the Rhone Valley where he was later pronounced dead. It was a tragic loss of life, but was just one of many this season across the Alps. 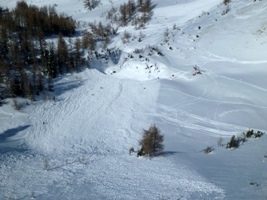 So far, over 40 people have been killed in avalanches in the 2012/2013 winter season. Some of the victims have been unlucky; others have been completely reckless. So, if we are to take anything positive from this most recent accident, we need to study the events that led to it and the decisions made that day. Location: Les Jeurs area, just North East of the Tete de Balme chair, Domaine de Blame, Chamonix. Avalanche initiated around 2060m on a convexity and slid to 1800m. The victim was carried into a massive wind-scoop, and deep-buried under the debris. Was the rider equipped with safety gear ? Yes, he was fully equipped, and initiated his airbag. However, the terrain trap meant that he was still deep-buried. 16 Mar: Blue sky, very cold, stable weather. 2/5>1600m, 1/5<1600m. 17 Mar: Overcast, strong foehn wind blowing in Chamonix. 3/5>3500m, 2/5<3500m. 18 Mar: Poor Visibility, and heavy snow in Chamonix. Windy at altitude. 2/5 increasing to 3/5. 19 Mar: Blue skies. 4/5>2300m, 3/5<2300m. NB: It is rare that we tweet so much detail in a forecast that we need to use 2 tweets. Having seen several photos taken by the rescue team on the day of the incident it is notable how many people had been skiing the back bowls of Le Tour. This area is renowned for avalanche danger and terrain traps yet there are dozens of tracks in the photos. There were also numerous other avalanches triggered in the area that day by skiers and boarders. All appear to be on steep slopes that have been subjected to loading by the prevailing wind. However, they all ran out onto even ground where the debris spread out. 1. Never ride alone off-piste. EVER. 2. Always plan your day to minimise the avalanche risk. If particular slopes have been identified as high risk, plan your day to ride elsewhere. 3. Always select your terrain carefully to avoid convexities (possible trigger points), and terrain traps. 4. As avalanche risk increases, decrease the angle of slope you are prepared to ride. 5. Although airbags increase your chance of survival they do not elminate all risk and are often useless in terrain traps. We still have 6 more weeks until the lifts close for the end of season in Chamonix. Lets hope that we dont have any more avalanche accidents.